When I saw this CD was coming out my first thought was, “Why?” We already have brilliant recordings of “Die Schöne Müllerin” from artists like Fritz Wunderlich, Dietrich Fischer-Dieskau, et. al. With recording companies scrambling for shares of a disappearing classical market, I would have thought a new recording of Schubert’s great masterwork, even by one of today’s most exciting tenor voices, would have been way down the list. And unlike Renée Fleming or Susan Graham, Jonas Kaufmann has never spouted a burning desire to explore the great song literature. I was expecting to hear a beautifully sung, rather generic performance, with the occasional nod towards a passing textual nuance. I am happy to report I was wrong on all counts. This is a marvelous recording, full of life, emotion, and color. 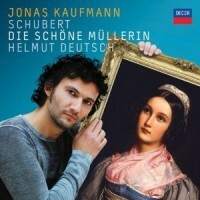 Kaufmann’s singing is not only drop-dead gorgeous throughout, but he brings a youthful vigor and fresh perspective to songs that have become tired and over familiar to many listeners. For me, it was like listening to a series of wonderfully acted solo scenes in a very personal one-man opera. Without sacrificing taste or musicality he uses his remarkable vocal resources to explore the internal emotional landscape of a young man lost in love. In every song there was a phrase here, an inflection there, or an unexpected vocal choice that brought something new and fresh to something dry and over-familiar. A single example will suffice to illustrate my point. In “Ungeduld,” note how many different ways Kaufmann finds to sing the climactic phrase “Dein ist mein herz und soll ist es ewig bleiben,” before his final, triumphant affirmation of a love that we know will never be. He is matched in every respect by the remarkable playing of Helmut Deutsch. From the first notes of “Das Wandern” to the final chord of “Des Baches Wiegenlied,” the accompaniment comes to vivid life though loving attention to detail and remarkable articulation. I’ve never heard it played better.